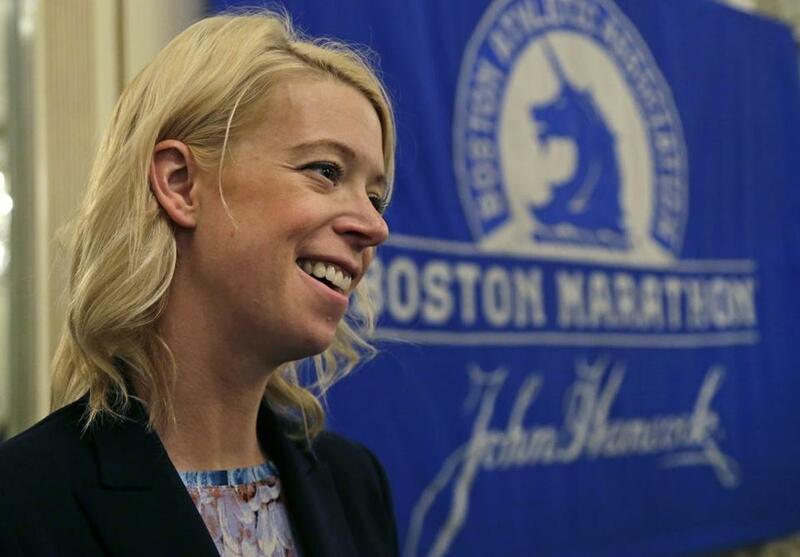 Boston Marathon bombing survivor Adrianne Haslet. Adrianne Haslet, the dancer who lost part of her leg in the Boston Marathon bombings and became a symbol of resiliency, is drawing inspiration from Tom Brady as she continues her recovery after being struck by a car earlier this month. On Monday, Haslet took to Instagram to give a shout-out to the New England Patriots quarterback, one day after he led the Pats to a thrilling overtime win against the Kansas City Chiefs in the American Football Conference title game. She also posted a three-year-old photo of her and Brady taken when she returned to the marathon course as a runner on a prosthetic leg. Haslet was struck by a car in the Back Bay on the evening of Jan. 5 and has been recuperating at Spaulding Rehabilitation Center. She lost part of her leg during the April 15, 2013, bombings, which killed three people and wounded hundreds more. The perpetrators also killed an MIT police officer while they were on the run. Travis Andersen can be reached at travis.andersen@globe.com. Follow him on Twitter @TAGlobe.